Just got my Rapid LED Corona lights! I ordered 2 of the new Rapid LED Coronas for my new setup, and they just came in! So far I have just checked them out, out of the box, but they look awesome and well made! Here are some pictures, I'll post more tonight when I get home and fire them up! Ok. I got one of them fired up. Initial setup is easy to do by just following the directions in the app once you download it. I do wish there was an actual power button on the light itself, because if you plug the cord into the wall before plugging into the light, it can spark.... this isn't a major issue, but it was a bit of a surprise. In a completely quiet room I was able to hear a high pitch (electronic) noise coming from both the light and the power supply, but in the room by my tank I couldnt hear it at all, so I'm not worried about it. The fan was the same story, could hear it faintly in a completely quiet room, but nothing in room with the tank. So I went through the app setup and got it connected to the light. Setting up the light schedule is pretty straight forward. it takes you through setting up each color channel. Below is a picture of the violet channel. I set up 2 segments as shown by the graph. unfortunately it doesnt seem that you can drag the dots up and down, you have to scroll through the % as shown in the second pic. not a huge deal, but it would have been nice to be able to make quick changes by dragging the dots. You continue through, setting each channel until you get the graph of all of them at then end. These are all set to different peak values at 5pm, but if I had different segments (like the example above) it would show that curve here. From that main screen you can override the program temporarily by clicking "Manual override" , then selecting a duration for the override. It then shows sliders for all the channels that you can slide back and forth. There is also a timer that counts down the time left in override. I will try to get these over water in the next few days to get some par readings. I had more pics to post, but photobucket is resizing them big for some reason... anyway, heres a pic of the light on. Very cool. I am interested in seeing the par on those. I have 3 of these on order with the Android can't wait to get them. Following along, looking forward to seeing it over the tank. I'm hoping to have par readings tomorrow evening. I'm in the process of changing from my 90 gallon to a 150. I got all the rocks out of the 90 today and got baseline par readings of my current lights. I'll be setting up the Coronas over the 90 tomorrow to get a head to head comparison, and also to get the data to share with everyone. It all looks pretty good. But at the Rapid LED website they offer a PAR map that shows the PAR at 24". The center is at 400 to 500. If that's 24" of water, that's great! But if it's 24" of air, I'm not very impressed. The website doesn't say? So how deep is your tank? I'm really looking forward to seeing your PAR readings. my tank is a standard 90 gallon, so it's 24 deep. mfg par charts seem to be all over the place to be honest, and have very little info on how they are tested. I'm looking forward to seeing what I find when I get them hooked up as well! Definitely look nice! Id love to see how they look in on top of the water and growth as well. OK, so I have data, but let me get some info out first. 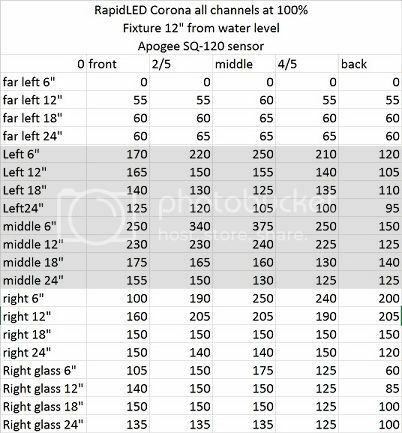 Third, I have already realized i missed some data points that may have been useful, ill try to fill these in later, as well as dropping the light fixture down a little closer to the water. Here is a picture of both Lights on. Here is a picture of one light on, and the grid I used to measure PAR (i collected data on one light only.) 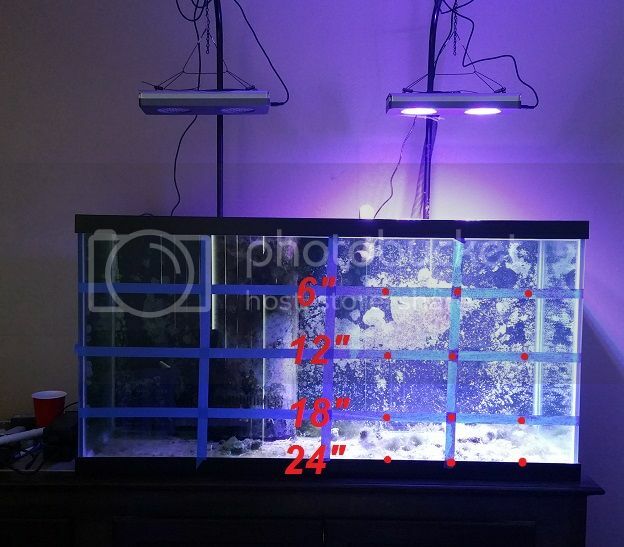 I took a measurement at each of the red dots, at 5 places across the width of the tank. the measurements are inches below water level. Here is the data I got. Sorry I know it's a little tough to read through the data, if anyone has a better way to arrange it let me know. so 375 peak in the middle at 6" below the water with the fixture 12" above the water. I realized after testing that I really only tested the middle ~12" of the light across the tank. later I will try to add data points at the middle of the tank and against the glass on the right. Those are pretty good PAR numbers. Rapid LED did get back to me pretty quickly (good for them) and the test they did was thru 24" of air. Ya Rapid LED has always had good communication (I've ordered various things from them many times over the last few years). Initially I felt like the numbers were low, but to be honest I'm completely confused when it comes to par numbers these days. looking up the new AI Hydra 52 HD it looks like their numbers at 24" in air are much lower than the Corona. Radions chart shows way higher (double), but it doesn't say what height its measured at... My guess is its at 12"..
Like I said in my post, I think its probably much higher than I'm reading, but the blue spectrum isn't picked up correctly with the meter I have. Nice. I got mine last week too. It's a little has a purple/violet to my eye when all the channels are on at equal percentages. Any suggestions on how to acclimate corals to the corona? I previously had a 250w hqi over my 24 cube. Gotta love the great customer service rapidled provides. Turn it WAY down to start (like start at maybe 10%), then increase very slowly. other than that I don't know... haha. LED targets certain wavelengths where MH is more blended, so I think LED shocks corals at first even at the same "PAR"
I would be super careful with your 24 cube... you can cook corals quick! OK, a little more data here. I added the 2 ends (middle of the tank and right glass) NOTE: this tank has a center brace, so the points in the middle of the tank are somewhat shaded. 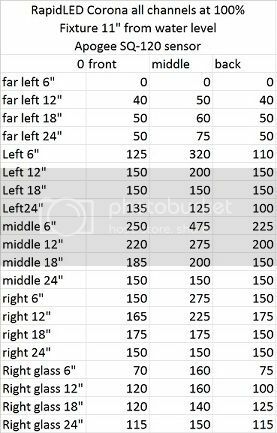 So dropping the fixture 1" raised the middle 6" value by 100 PAR. The middle of the tank is bumped up a little, and the bottom is pretty much the same. I'll have to update when I get my 150 up and running (what I'm ultimately putting these lights over) I suspect I'll end up running them at ~10" and dropping the power some. I'll have to see how the coverage is but I suspect it will be pretty good with the 2 fixtures,with shaded ends. But we'll see, I may need a 3rd. Nice job and thank you for setting that up and collecting and compiling the data. I have 4 on order with the android app. 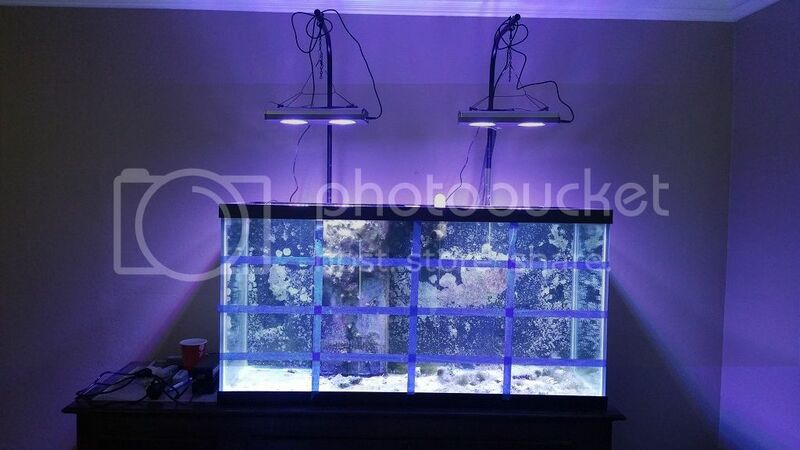 Looking forward to seeing these lights over my tank. any updates or opinions on the light? sorry I haven't checked this thread recently. Unfortunately I'm still in the process of getting my tank set up (it always takes longer than we expect doesnt it? ), so I haven't really used them yet other than the testing I did here. no problem mine shipped out today, and now I'm in the process of buying a new home don't know when i'll get to set them up. No time soon. 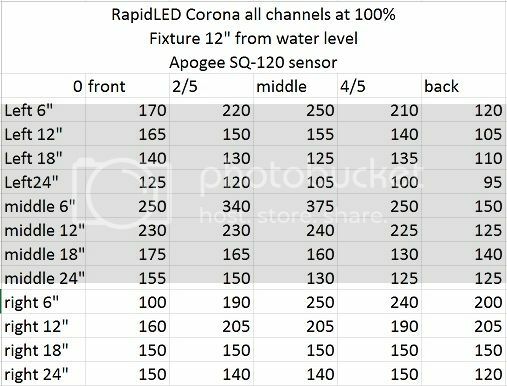 Just my 2 cents on corona led. My dad have 4 of them over his tank. When the lights works, it is absolutely beautiful. The problem is that it doesn't work all the time as it have problem with the cloud server and the software is buggy as hell. Rapid have been fairly quick to reply, but something is out of their control. Hence the jury is still out on it as I have 3 coronas led myself and it is still not being put through its pace yet. Don't take my opinion as the common theme. I think it still need to iron out some of their back-end software deal. When the lights works, it is absolutely beautiful. Quick question. How loud are the fans? How does the cloud affect the light working locally? Please see my second post for a more detailed answer, but they are not loud.